0 Comments Published by KL Ocs Kid on Monday, May 28, 2007 at 11:41 AM. Liverpool co-owners George Gillett and Tom Hicks have vowed to back boss Rafa Benitez in the summer transfer market. And American Gillett has not discounted a move for former Reds striker Michael Owen, whose future at Newcastle has been the topic of intense speculation. "He is a great player but it is down to Rafa's recommendation, not us," Gillett said of the England international. In an effort to stave off interested parties, new Magpies boss Sam Allardyce met Owen for the first time this week. Allardyce interrupted his holiday to talk to the 27-year-old in the build-up to the England B international against Albania and outline his ambitions for the St James' Park outfit. Owen has spent 10 months on the sidelines fighting his way back to full fitness and managed to play in his club's last three games of a difficult season. But there are reports of a get-out clause in his contract and speculation that he could be available for as little as £9m. Owen moved to Tyneside in a £17m deal from Real Madrid in August 2005, but has managed only 14 appearances to date following knee and metatarsal injuries, although he has scored seven goals in his first 10 starts. 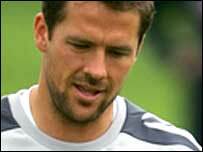 In eight years at Anfield before his move to Spain, Owen scored 179 goals in 351 appearances. But Gillett and Hicks are not limiting themselves to Owen after promising Benitez funds to help Liverpool compete for the Premiership next season. "If Rafa said he wanted to buy 'Snoogy Doogy' we would back him," added Gillett. "Rafa's feeling is we need more depth because of the rigours of the schedule to be competitive. "In every sport I participate in, there is a difference between a league season and the play-offs. "That's where the genius of the manager is so essential and that's where Tom and I have to defer to his background and genius."